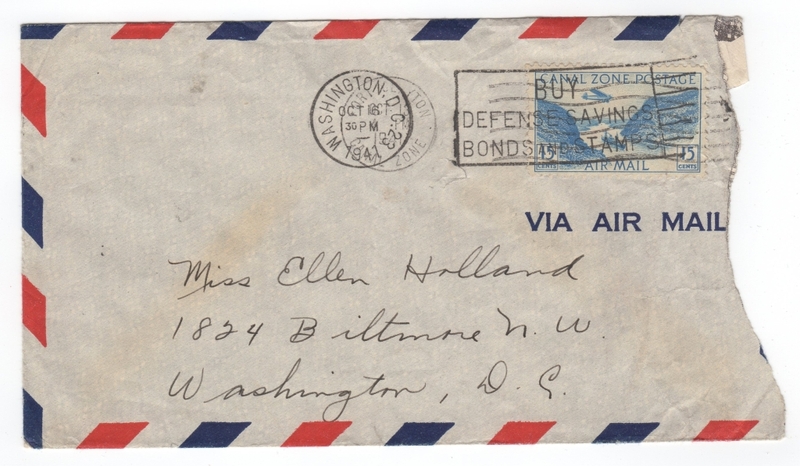 The following cover was sent via Airmail from Fort Clayton, Canal Zone to Ellen Holland in Washington DC. It initially was postmarked in Fort Clayton on October 13th, 1941. Then postmarked again upon arrival in Washington DC on October 16th. Fort Clayton was a US Army Base in the Canal Zone. This cover features Canal Zone Scott #C10 and is postmarked (in DC) with the common “BUY DEFENSE BONDS AND STAMPS” slogan cancel.